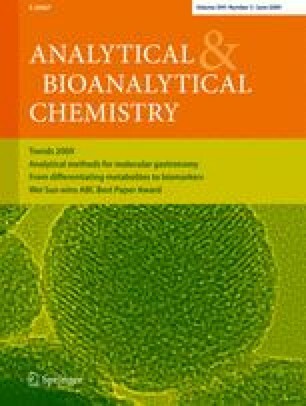 The headspace solid-phase micro-extraction technique with on-fibre derivatisation followed by gas chromatography-tandem mass spectrometry has been evaluated for the analysis of 1,3-dichloro-2-propanol in water. An asymmetric factorial design has been performed to study the influence of five experimental factors: extraction time and temperature, derivatisation time and temperature and pH. The best extraction performance is achieved in the headspace mode, with 5 mL stirred water samples (pH 4) containing 1.3 g of NaCl, equilibrated for 30 min at 25 °C, using divinylbenzene-carboxen-polydimethylsiloxane as the fibre coating. On-fibre derivatisation has been used for the first time with 50 µL of bis(trimethylsilyl)trifluoroacetamide at 25 °C during 15 min, leading to effective yields. The proposed method provides high sensitivity, good linearity and repeatability (relative standard deviation of 5.1% for 10 ng mL−1 and n = 5). The limits of detection and quantification were 0.4 and 1.4 ng mL−1, respectively. Analytical recoveries obtained for different water samples were approx. 100%.